Moong Dal Puttu/ Moong Dal Sweet- a tasty sweet made with moong dal, ghee, jaggery and nuts for toddlers, kids & for the whole family. Moong dal puttu is a traditional recipe prepared during Navarathri festival which is being celebrated in India. This sweet is loved by all ages starting from kids to elders. Moong dal puttu is a protein and iron rich sweet which can be given to kids from one year as a breakfast or as an evening snack. Now Let’s check how to make this moong dal puttu recipe for toddlers and kids. Measure the moong dal. Wash and soak in water for an hour. 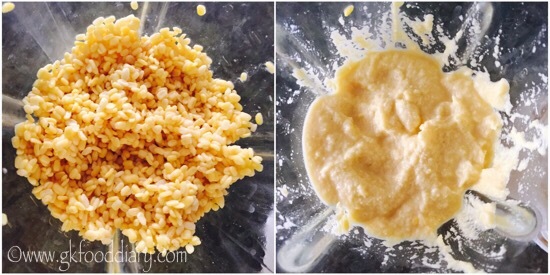 After one hour, drain the water completely and grind the moong dal to a smooth paste by adding 2 tbsp of water. The batter should be thick and not watery. Next step is to steam the ground moong dal. Heat the Idli pot with one cup of water and fill the mould of idly plate with the ground moong dal batter. Steam it for 12 to 10 minutes or until a skewer inserted comes out clean. Then unmould the idlies from the plate. Remove the steamed moong dal idlies and while it is still warm crumble them well with your fingers and keep aside. 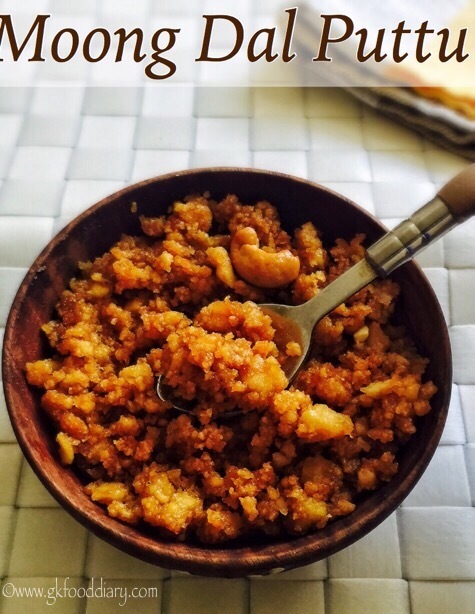 You can also use blender/mixie to crumble the moong dal idli. Use pulse option to crumble quickly. Then measure jaggery. 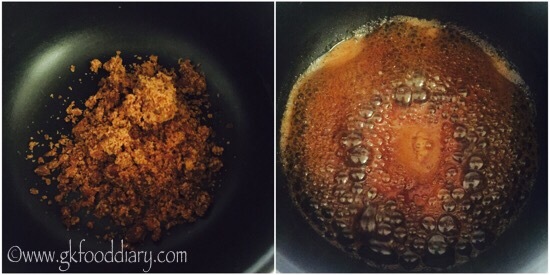 Heat the jaggery with water in a saucepan until rolling boil and slightly thick. Switch off the flame once done and add cardamom to it. Set aside. 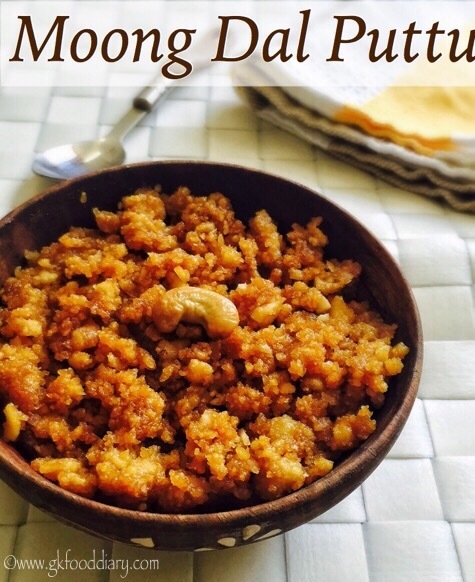 Add the crumbled moong dal to jaggery syrup and mix it till becomes dry and jaggery is completely absorbed. Then add scrapped coconut and give a quick stir. Heat a small pan with ghee and add cashews. Fry the cashews until golden brown and transfer the fried cashews to the moong dal puttu. Mix well and switch off the flame. 1. Measure the moong dal. Wash and soak in water for an hour. 2. 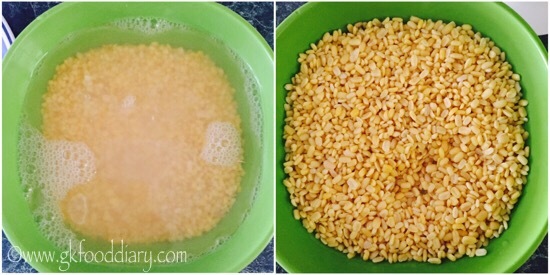 After one hour, drain the water completely and grind the moong dal to a smooth paste by adding 2 tbsp of water. The batter should be thick and not watery. 3. Next step is to steam the ground moong dal. 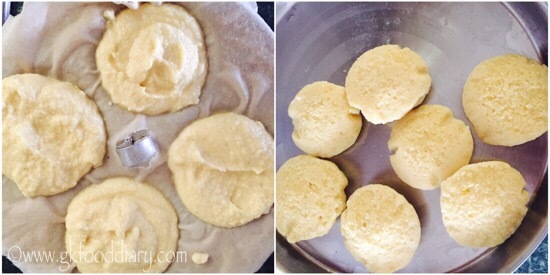 Heat the Idli pot with one cup of water and fill the mould of idly plate with the ground moong dal batter. Steam it for 12 to 10 minutes or until a skewer inserted comes out clean. Then unmould the idlies from the plate. Remove the steamed moong dal idlies and while it is still warm crumble them well with your fingers and keep aside. 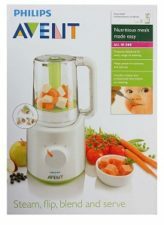 You can also use blender/mixie to crumble the moong dal idli. Use pulse option to crumble quickly. 4. Then measure jaggery. 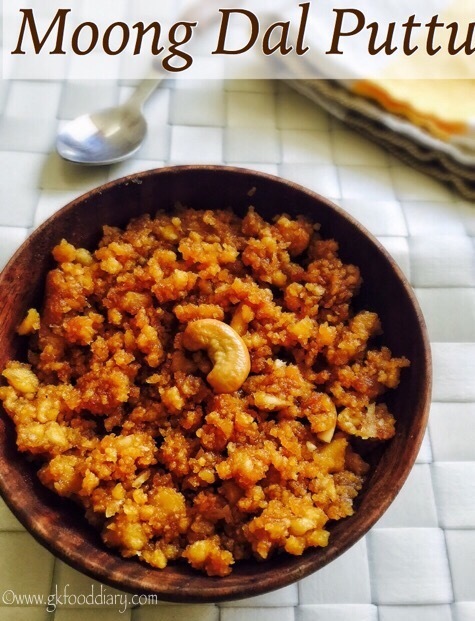 Heat the jaggery with water in a saucepan until rolling boil and slightly thick. Switch off the flame once done and add cardamom to it. Set aside. 5. 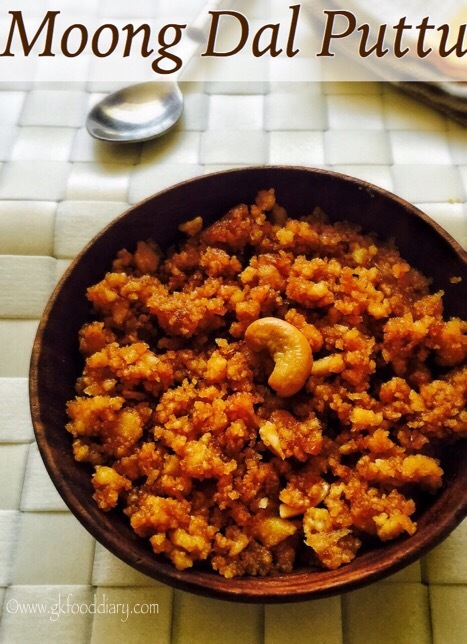 Add the crumbled moong dal to jaggery syrup and mix it till becomes dry and jaggery is completely absorbed. Then add scrapped coconut and give a quick stir. 6. Heat a small pan with ghee and add cashews. 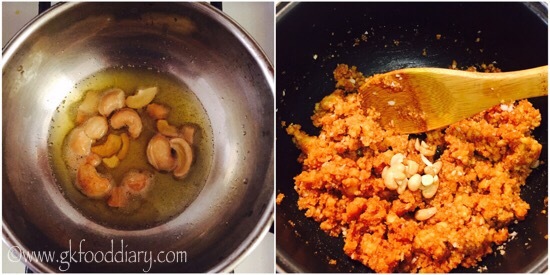 Fry the cashews until golden brown and transfer the fried cashews to the moong dal puttu. Mix well and switch off the flame. Tasty moong dal puttu is ready ! Heat jaggery in low medium flame in order to avoid burning in the bottom. The color of the puttu depends on the type of jaggery used. Crumble the moong dal idli when its warm otherwise the idlies may turn hard. You can also use blender/mixie to crumble the moong dal idli. Use pulse option to crumble quickly. 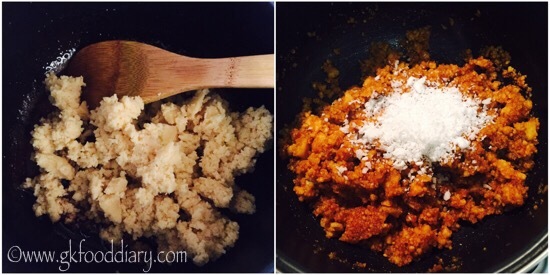 Mix the puttu until jaggery is completely absorbed otherwise the puttu will be moist.